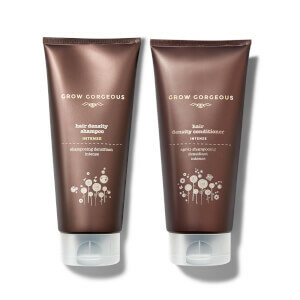 Witness fuller-looking locks with Grow Gorgeous' Hair Growth Serum Intense and Density Shampoo Intense. Working in synergy to promote longer, denser-looking hair, both products utilise a host of technologies to leave every strand feeling stronger, healthier and fuller-looking. Achieve visibly thicker hair with this intense hair growth serum, developed with a 40% concentration of nine technologies. With its Stabilized Dihydroquercetin-Glucoside Complex, the serum contains Glycine and Zinc to improve hair length for a fuller appearance, whilst a unique form of water-compatible Caffeine absorbs into the scalp to reduce hair loss in a small time period. Its Acetyl Tetrapeptide-3 and Clover Flower Extract Active Complex has been proven to visibly increase hair density by 13% within four months, whilst Bio-Active Pea Sprout starts to work within two weeks to visibly improve hair growth by 78%. Enriched with Hyaluronic Acid to penetrate the scalp and boost hydration so you can experience luscious, voluminous locks. An ultra-concentrated formula infused with Amino Acids, Biotin, Caffeine and B-Vitamins to visibly increase density of hair. Its advanced technology supports the follicles to promote healthy-looking locks. Delivering gentle, yet effective cleansing to prevent damage to hair, the shampoo is ideal for slow-growing and thinning hair, or for weak fibres in need of strengthening. Suitable for all hair types, including colour-treated, you can expect denser, fuller looking locks. Serum: Apply 20 drops to the scalp once a day, either in the morning or the evening. Massage thoroughly until all the serum has been absorbed into your scalp. Do not apply to the eyelashes or eyebrows. Do not exceed the recommended dose. With proper application each bottle should last approximately 2 months. Serum: Aqua (Water), Sodium Hyaluronate Crosspolymer, Glycerin, Butylene Glycol, Caffeine, Propanediol, Dimethyl Isosorbide, Maltodextrin, PPG-26-Buteth-26, Parfum (Fragrance), Acetyl Tetrapeptide-3, Hydrolyzed Sodium Hyaluronate, Trifolium Pratense Flower Extract, Scutellaria Baicalensis Root Extract, Glycine Soja Germ Extract, Triticum Vulgare Germ Extract, Larix Europaea Wood Extract, Pisum Sativum Extract, Camelia Sinensis Leaf Extract, Arginine, Glycine, Lactic Acid, Dextran, Zinc Chloride, Calcium Gluconate, Gluconolactone, Pentylene Glycol, Trisodium Ethylenediamine Disuccinate, PEG-40 Hydrogenated Castor Oil, Polyacrylate Crosspolymer-6, Hydroxyethylcellulose, Xanthan Gum, Urea, Sodium Benzoate, Ethylhexylglycerin, Sodium Metabisulphite, Chlorphenesin, Phenoxyethanol, Butylphenyl Methylpropional, Hydroxyisohexyl 3-Cyclohexene Carboxaldehyde, Limonene, Linalool, Alpha-Isomethyl Ionone, Cinnamyl Alcohol, Citral. Shampoo: Aqua (Water), Cetyl Betaine, Polyquaternium-37, Niacinamide, Parfum (Fragrance), PPG-26-Buteth-26, Lauryl Betaine, Ethoxydiglycol, PEG-40 Hydrogenated Castor Oil, Sodium Chloride, Caffeine, Inositol, Arginine, Biotin, Acetyl Cysteine, Acetyl Methionine, Oxidised Glutathione, Panthenyl Ethyl Ether, Glycine, Alanine, Serine, Valine, Proline, Threonine, Isoleucine, Phenylalanine, Aspartic Acid, Histidine, Sodium PCA, PCA, Saccharomyces (and) Zinc Ferment, Saccharomyces (and) Selenium Ferment, Milk Protein (Lactis Proteinum), Sodium Lactate, Urea, Sodium Citrate, Lactose, Citric Acid, di-Sodium Hydrogen Phosphate, Glycerin, Maltodextrin, Trisodium Ethylenediamine Disuccinate, Hydroxyethylcellulose, Xanthan gum, Alcohol Denat, Diethyl Phthalate, Phenoxyethanol, Chlorphenesin, Alpha-Isomethyl Ionone, Butylphenyl Methylpropional, Cinnamyl Alcohol, Citral, Hydroxyisohexyl 3-Cyclohexene Carboxaldehyde, Limonene, Linalool. I suffered from hairfall due to stress and ageing . I tried several products:oil, vitamins and massages but the results were as much disappointing as ever. Finally i started to accept the way i looked, nearly bald at some places in the head. I looked older than my age and friends' pitiful gazes and advice simply added salt to my injuries. My husband lovingly gifted me this product one day. Needless to mention, i felt insulted once again despite myself. It was only to please him that i used the product initially, convinced that my situation won't change by much. But i was was wrong. Within days, my hairfall diminished considerably. In two weeks time, i could feel prickling short hair when i touched the scalp for massaging. Hence, i am expressing my gratitude to the one who came up with this serum. Thank You.Keep up the quality standard!